The sound of a conch shell being blown is like no other; soft and rounded, but completely penetrating. It is a divya dhwani – a divine sound, that glorifies, protects, celebrates and purifies the consciousness of all who hear it. As a writer, dancer, musician and artist, I always hope that the words, images and sounds I release into the world have this uplifting effect. Спасибо большое за предоставленую на сайте информацию! Ах, таких замечатальных и редких рисунко больше нигде не встретиш! Would you care to enlighten us at some point of time about Krishna consciousness? That is a rude and personal comment about this devotees parent. If you have an issue with her father have the backbone and dignity to confront him directly rather than in is this roundabout and infantile way. You are not painfully far…you are joyfully close ! Nice explanation about the conch. Would it smell like camphor ? Would it smell like lotus? Would the red lips be sweet as honey? 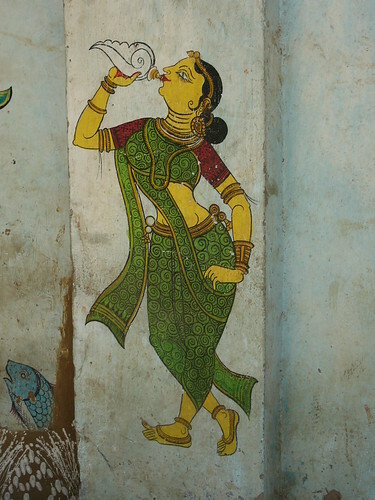 What is the taste of Krishna’s lips? Your post reminded me of this poem. i totally love her poetry, too! And, this poem is particularly wonderful, as only someone as madly in love with Krishna as she is, could have written something so wonderful! Sunday FEB 15th at manor. Please allow me to sign up for your blog. I am a fellow artist/used to be dancer. You inspire me a lot! The first time I heard you sing kirtan my heart stopped! Pingback: Egyszerű élet, magas szintű gondolkodás | Üdvözlünk a Magyarországi Krisna-tudatú Hívők közösségi oldalán! You know this Conch connection seems like chosen one to you, your voice is clearly uplifting, different and has resemblance to conch voice. You should sing solo more often than kirtan’s. In kirtan’s your voice, which is a blessing, just loses its effects like “Ganga is sadly full of mud” . This is just my point of view. It’s an unusual tone, a distinctive lilt. In my limited understandings of such matters I can still tell that you sing with the devotion of Krishna. Thankyou Jahnavi, for being a link. Jahnavi, Thank you for being such an inspiration. No words to express heartfelt gratitude. I liked the beautiful explanation about why the little conch? You are mulch-talented personality. I read your other blogs and articles as well. They are so beautiful, written with so much precision to draw complete attention of the reader. Also KC philosophy is explained in such a simple manner. Its a great gift. You are a great asset to ISKCON movement. Blessed we are to know you. With the mood of that little conch and mercy of Radharani I have blown a biggest war against both Maya and Kali on Aindra Prabhu’s Appearance day 7th April 2013 by Inaugurating 12hour Kirtan at my home in Mumbai. I am badly wounded but still most blissful serving the Holy Name, Srila Prabhupada and my most beloved Radharani. In eleven months so far Eleven 12hour Kirtan are conducted. The target is to spread 12H Kirtan in every town and village of the world. So far it has started in Estonia, Johnpur(a small village in India), devotees are putting efforts to inaugurate it in Porbander (India), Germany (Berlin and Gena), Canada (Toronto). Please pray 12Hour Kirtan in Every Town and Village becomes reality very soon. Please like 12Hour Kirtan In Every Town and Village page on Facebook. Please keep writing your blog to let the stream of nectar flow.